Carmita Alonso and Ed Estrada visiting with their two sons around a “waterfall countertop” of Cambria quartz. A countertop also runs along the entire kitchen wall, which has floating shelves, flatpanel cabinetry with no observable pulls, and a glass tile backsplash. Pendant lights made of silver circles of capiz shell or crystal express the “glitzier” side of homeowner Carmita Alonso’s personality, as she puts it. A view of the living room the daybed is covered with Restoration Hardware fabric, an Italian white leather sectional, a weathered gray drop-leaf table, and a V-match ceiling with white oak ceiling beam. Note the decorative “shadow line” that edges the ceiling beam and white oak mantel. It echoes the nickel-gap in the paneling above the stone veneer fireplace. The palette throughout the house is neutral with occasional aqua accents. In order to maximize places to sleep, residential designer Erik Peterson and builder Jon Moody of Richard Moody and Sons Construction found creative ways to add storage to the design. In this bunkroom for guests, drawers are incorporated below the lower full beds and within the stairs to the upper twin beds. Each bed has its own charging station, nautically inspired lamp, window, and storage nook. The upper bunks also have steel bars fashioned by Tunnelwerks International. A guest room with a Pottery Barn bed that allows for storage underneath (and thus no dresser in the room). The rattan bench with wood base is from Wayfair. Here, again, mirrors have been used as decoration. The boys' bedroom is decorated in a nautical theme. The front entrance’s walls flare outward at a 10-degree angle then join an archway with blocky modern trim that references the vernacular by using the gap that you might see in more traditional nickel-gap paneling. A sliding barn door leads to the powder room and laundry room. The floor has been whitewashed to suggest driftwood. Angled walls form the entry of the house. (The built-in bench picks up on the angle on its sides.) Mirrors are used here and throughout the house, in order to make spaces look bigger and to reflect the outdoors. The owners’ bathroom makes abundant use of marble. 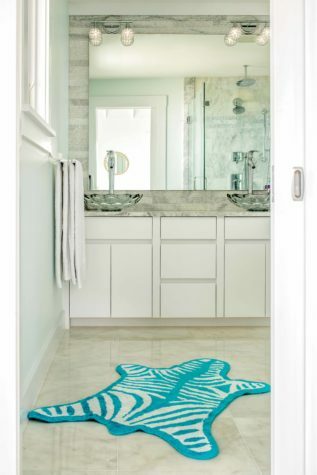 The turquoise zebra rug is from Jonathan Adler. Modern chic meets cottage shingle on Moody Beach. We’re lawyers, so we both always have opinions on things,” says Carmita Alonso of herself and her husband, Ed Estrada. They and their sons, however, were in complete agreement about buying a house on Moody Beach in Wells. They already had a home there, but not one on the beach. When such a property became available, the New York–based family drove north through a blizzard to see it. The house faced the very stretch of sand on which the family liked to take walks, and it had views of the nearby salt marsh. The existing structure had a lot to recommend it—Alonso thought it was “homey and cute”—although a large red-brick fireplace blocked the views, and the knotholes in the upstairs wood floors allowed one to see through to the ground floor. Here opinions diverged. Estrada thought the house needed a renovation. Alonso thought it needed to be knocked down and rebuilt. “I had to let him reach the same conclusion,” she jokes. Because of setbacks and other regulations, Peterson designed the house on piers. Many of the houses on Moody Beach are 50 feet by 100 feet, an allotment that can be somewhat boxy, says Peterson. To work against this tendency, he broke up the mass of the house, cantilevering the second floor over the first and using peak gables of different sizes, varied fenestration, and shingle flares between the first and second floor. He also incorporated porches that alternatively press forward (as does a circular front porch with banquette seating) and press back (as does an inset balcony off an oceanside bedroom). Inside, Peterson worked against the box by angling the walls by 10 degrees, a surprising choice that creates visual interest while opening up views and maximizing space. Where you first step into the house, the foyer walls angle outward, as if they are doors swinging open to the sand and water. You “explode” into the view, as Peterson says, because once inside the house you are looking through the structure at a stunning stretch of sand and ocean. Glass fills the back wall of the first floor’s central space, in the form of an oversized bay window (with daybed), glass doors, and two outsized casement windows. The first floor is chic and modern, with white oak floors that have been whitewashed to suggest driftwood and a white leather sectional couch that faces a natural stone veneer fireplace with a white oak mantel. A sleek kitchen occupies the right side of the room. Dividing kitchen and dining area is an island with a waterfall countertop— that is, a countertop where the surface material spills over one wall of the island until it meets the ground. An additional counter extends the length of the kitchen–dining area wall. Above the countertop, this wall has two translucent window cabinets that frame a glass tile wall with floating shelves displaying dishware. Below the counter, the cabinetry is flat panel with a routed edge (rather than an observable pull), which keeps things looking clean. 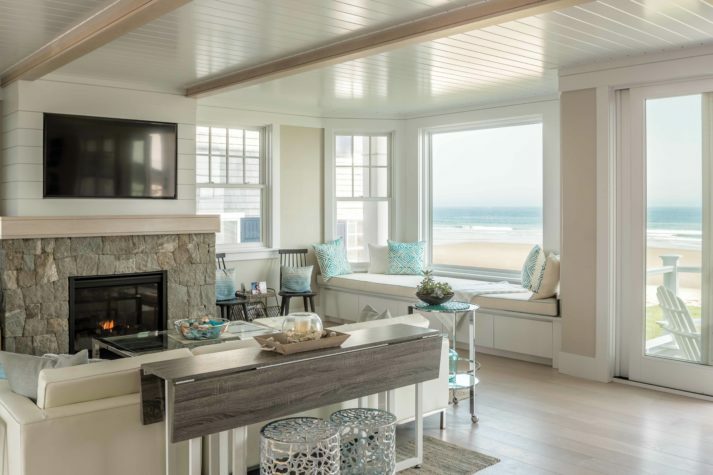 The natural neutrals of the first floor are accented with the blues and aquas of the dishware; the blue, tan, and white swirls of the thick Cambria quartz countertop; and the light aqua pillows on the daybed. 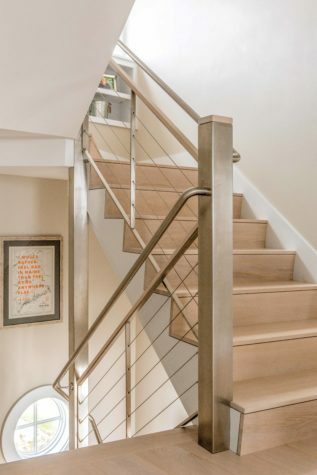 A switchback staircase of white oak with stainless-steel cabling and stainless-steel newels leads up to the second floor, which has a bunkroom, office, guest room, and owners’ bedroom, and then to a third floor with an extra sitting area and an adjacent boys’ bedroom with twin beds and white quilts decorated with small navy anchors. The house reflects its location, and not only by being open to the views. 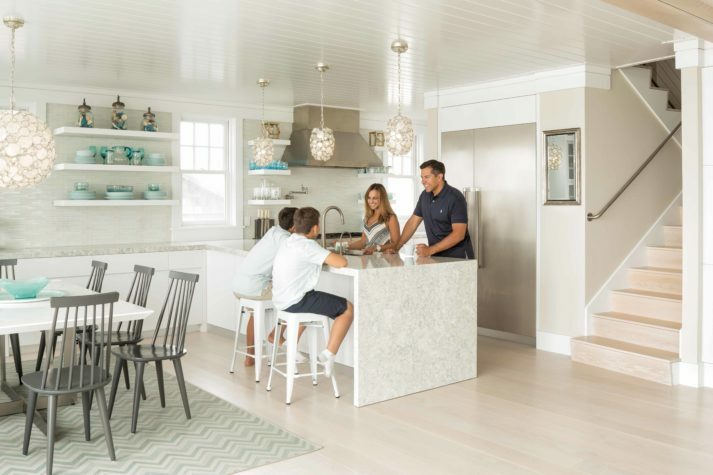 Maine appears in the form of shells in glass jars and sliding barn doors (for the kitchen pantry and powder room) and beach stone tile for the boys’ bathroom floor. But elsewhere the vernacular is embedded in the very design—as with the traditional white V-match paneling (used on the first-floor ceiling and above the fireplace) and the contemporary take on nickel-gap. “Nickel-gap” refers to boards being laid next to each other with a gap wide enough to fit a nickel. In the archway that separates foyer from great room, the blocky, angled trim is not traditional, but the gap that Moody and his crew incorporated into the trim is. He used a similar gap as a decorative “shadow line” for the edge of the ceiling moulding, the white oak fireplace mantel, and the white oak first-floor ceiling beams. Upstairs, hints of Maine can be seen in the owners’ bedroom, which has a vaulted ceiling with the open framing that you might see in an uninsulated summer cottage. 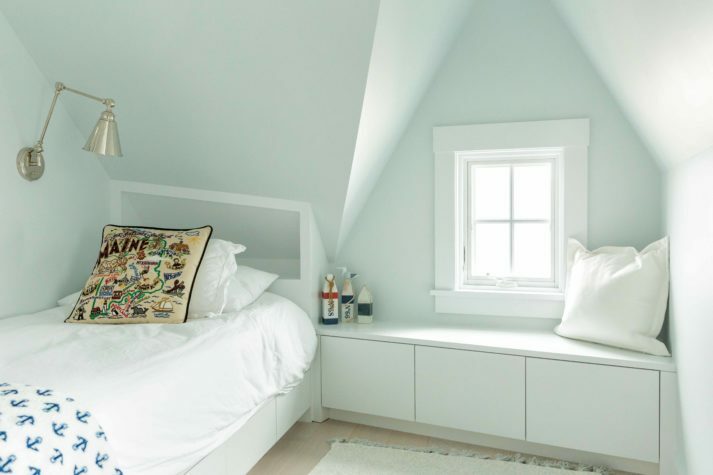 One particularly fun design project, says Moody, was the bunkroom, which is a nautically outfitted guest bedroom with two full beds below and twin beds above. Each bed has its own window and cubby with reading light and USBport charging station. Tunnelwerks (which is responsible for the steelwork on the staircase) also made fall bars for the upper bunks. Because storage is tight, given the lack of a basement and minimal attic space, the Moody team fit in extra storage wherever they could. In the bunkroom, the staircase that leads from one bunk level to the next incorporates drawers. Another surprise is the abundant use of mirrors as decoration. A giant porthole mirror hangs in the bunkroom. An oversized mirror composed of several circular mirrors faces another mirror in the second floor hallway. Mirrors face each other in the third-floor sitting room, and a mirror hangs to the right of the refrigerator. Even the frame of Alonso and Estrada’s upholstered bed’s headboard is a mirror. “You will notice they make a room look bigger or reflect the outdoors,” Alonso says. She first saw mirrors used as decoration in India, where she traveled for her work as an immigration lawyer. Even before she decorated her Wells home—and then once she had finished furnishing—she thought, “It’s such a cool thing to do, especially when you have a beautiful view outside.” Though she picked up the design trick in India, Alonso finds herself using mirrors here for one more pleasure: the way they reflect the Maine light, which fills the house, drawing people outside even as it illuminates a beautiful reason for staying inside. Residential Designer Erik Peterson of Peterson Design Group created visual interest on the facade of this cottage-style beach house with varied fenestration including an eyebrow and oculus window, horizontal banding, and slightly flared gables with decorative detailing at the peaks. The second floor cantilevers over the first, allowing for columns below. When the beach-facing side of the home gets chilly, a banquette on the curved porch offers views of the marsh. The house is built on piers with PVC slatting and storage on the ground level. Homeowner Carmita Alonso purchased all the lighting online, sight unseen, including the owners’ bedroom pendant, which is an orb made of turquoise beads with a mirrored band that circles the sphere. The light adds drama and a pop of color to the otherwise neutral owners’ bedroom, whose cathedral ceiling and exposed beam structure suggests the interior of historic Maine seaside cottages. A faux antelope rug is on the floor. The sectional sofa is from West Elm. 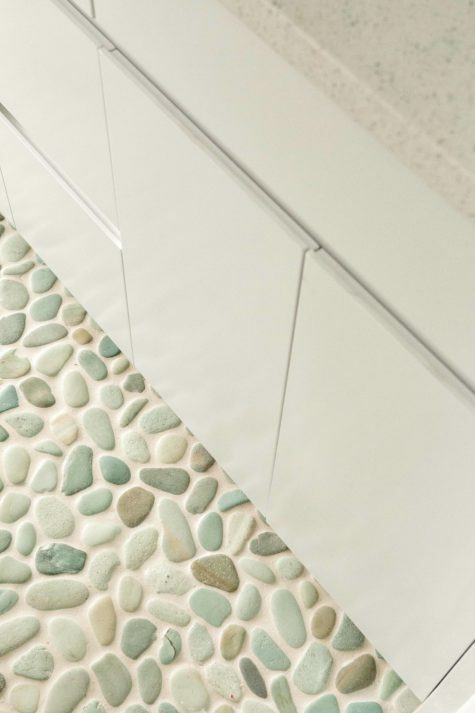 A detail of river stone tile on the floor of a bathroom intended for the children.